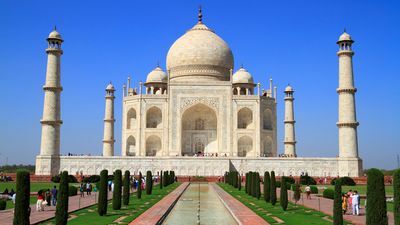 The Taj Mahal is best known for its white marble mausoleum, a symbol of eternal love, but this mausoleum represents only part of the site of the Taj Mahal. The latter is in fact a vast rectangular set, exactly 580m by 305 oriented North-South. In this it is very similar to the forbidden city of Beijing, although historically there is no connection. The Taj Mahal is located to the east of Agra, a city 175km from the capital of India New Delhi, in an area that was once the palaces and gardens of the lords, during the construction of the monument, in times from the apogee of the Mughal Empire in the seventeenth century. The Taj Mahal is adjacent to the north of the Yamunâ River, the main river passing through Agra. The opposite side, to the south, is adjoining the town, which extends to the rampart of the monument. From the outside one sees only the top of the domes, but one of the most beautiful views is about 500m south of the site, at the top of the first buildings. From there the mausoleum is perfectly detached from the surrounding vegetation, as is the great gate, called Darwaza-i rauza. The site of the Taj Mahal is separated from the exterior by a high rectangular rampart, elongated, oriented South-North. The interior is composed of 3 distinct parts in which the visitor follows a natural progression. The first part is to the south, it is the entrance of the site, the inner courtyard. Named "Jilaukhana", it has 3 gates (East, South and West) allowing entry and exit to the tourist site. This part is a bit of a lock between the external life, vibrant, and inner, spiritual. It is centered on a courtyard bordered by lawn. At the corners are 4 pavilions, the 2 mausoleums of the first two wives of Shah Jahan, and two functional buildings now containing the tourist office. To the north is the great gateway to the gardens, which symbolizes the passage to Paradise. This door is called "Darwaza-i rauza". The second part is the gardens of the Taj Mahal. They symbolize the Paradise and everything must be perfect there, that's why the lawns are impeccable and each element is perfectly ordered. 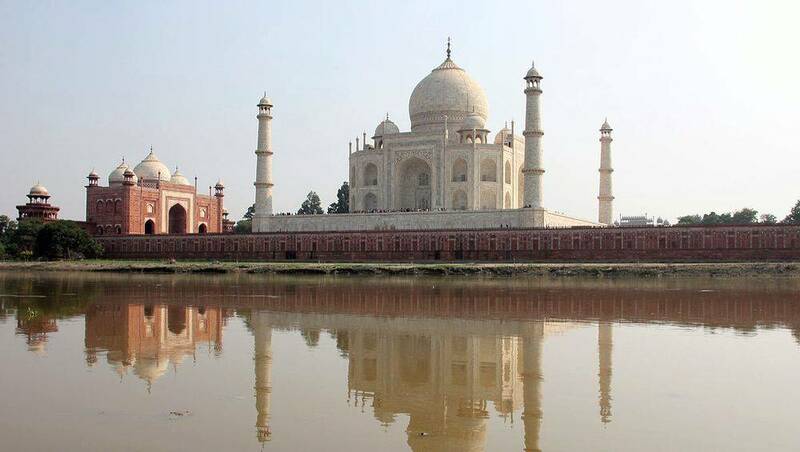 This is where the 4 famous water bodies are located in which the Taj Mahal is reflected. The garden is called "Chahar bagh". The third part is to the north of the complex, it is a large terrace called "Chameli Farsh" which contains in the center the mausoleum itself, to its right a mosque and to its left a false mosque "Jawab" , which has everything to be used but can not be used because it is not turned in the right direction, symmetry of the site compels. It is therefore an annex building, not a holy place, it is called "The pavilion of the guests". Visiting the site the walker makes a spiritual journey: A passage of purification (The southern part), the crossing of Paradise (the central gardens) and arrival at the mausoleum (The northern part). Important note: This map shows the current Taj Mahal, but at the time of Shah Jahan the southern course was in contact with a fourth part at the end of the complex, a place of great size and importance since it was the market and the arrival of the caravanserais. A place consecrated to everyday life and linked to the inner courtyard, passage of purification. This place is called "Taj Ganji". The inner courtyard is the most complex and complete part. It is accessed by one of the 3 doors pierced in the enclosure. The South Gate, the largest but also the simplest is called "Sidhi" or "Sirhi Darwaza". The East and West gates, respectively "Fatehabadi Darwaza" and "Fatehpuri Darwaza", are identical, with orientation. 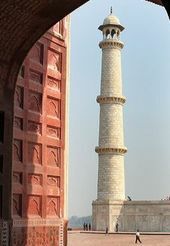 As you can imagine, "Darwaza" means "Door, passage, entrance". It is a small building about ten meters long and below which an opening has been drilled. The South Gate is taller and narrower. The inner courtyard, with arcades, lawns. The "jilaukhana" (literally "house porch") is an architectural element introduced into Mughal art by Shah Jahan, the builder of the Taj Mahal. The idea was to provide visitors with a space to get off the horse or elephant, get out of the crowd and be mentally prepared to enter the complex. It was thus, from its construction, a transitional space between the secular, external, and spiritual life, interior. 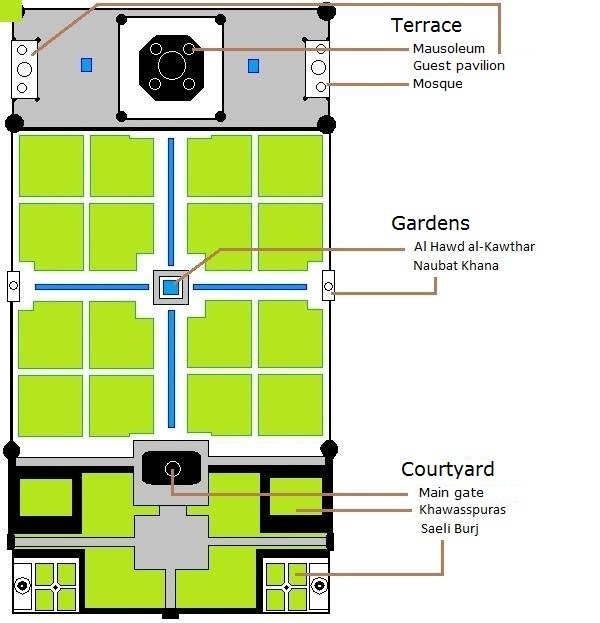 The rectangle formed by the crossroads of the 4 roads (3 coming from the exterior doors, one leading to the gardens) is thus cut into 4 grassed areas bordered by 4 buildings, all with a courtyard that is its own. The two southern buildings are the mausoleums of the first two women of Shah Jahan, for although the Taj Mahal was built for her 3rd wife (died in childbirth when her 14th child was born), her first two women were also entitled to a mausoleum, much more modest. They are called "Saheli Burj". The two North buildings are the "Khawasspuras" respectively. They were used for funeral services. These buildings are lined with multilobed arcades allowing to be sheltered in some kind of courtyard. They initially served to shelter part of the poor population during the winter months. Later they were used by street vendors who all had a sort of "room" under the arcades (there are 128), but this right of sale was abolished in 1996. Now the inner courtyard of the Tahaj Mahal became calm again. It is a very classical architecture, such a gallery being for example at the temple of the emerald Buddha, in Bangkok (Thailand). Next to the gateway to the gardens are the ticket office and a small cloakroom for those who have brought banned items. Be aware that the guards are quite strict and accept only a few objects, so use this cloakroom if necessary. 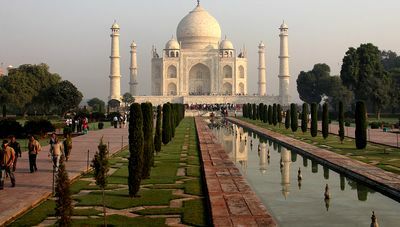 It was here that the anniversary of the death of Mumtaz Mahal, the wife for whom the monument was created, was celebrated. Let us now see in detail the two mausoleums. The Saheli Burj are secondary mausoleums placed at the southern corners of the inner courtyard. 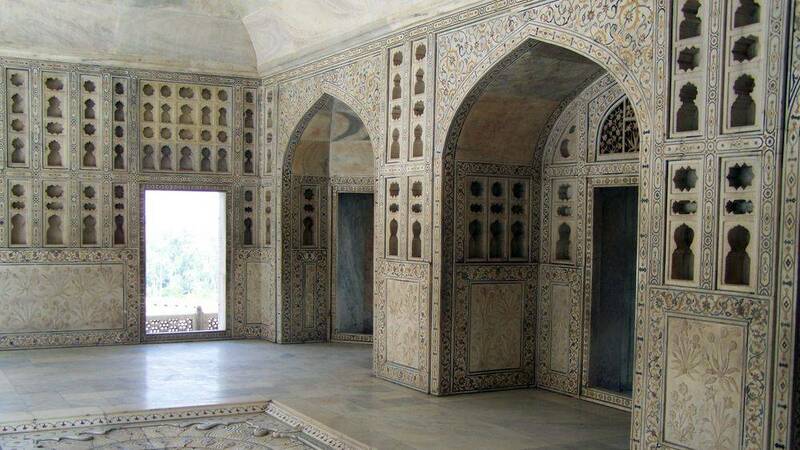 They are occupied by the first two wives of Shah Jahan, who placed in a single site his 3 wives. Recall that he himself is buried in the main mausoleum. The West Mausoleum belongs to Fatehpuri Mahal, according to a historical document written by Thomas and William Daniel in 1789. The two buildings at the north corners of the inner courtyard are called "Khawasspuras". They contained the maintenance staff of the site as well as the persons authorized to perform the funeral service and the "Hafiz" (the one who recites the Koran). This small inner courtyard is known as "The Fatehpuri Gate Court". It forms a rectangle whose arcades adjoin the back of the main door. The Khawasspuras were left for a long time abandoned since the end of the 18th century until 1900, then 1908, two years during which Lord Curzon restored them. Recall that India was a British colony and is still part of the Commonwealth. The Western Court was used as a daycare until 2003, but now it contains the tourist office. 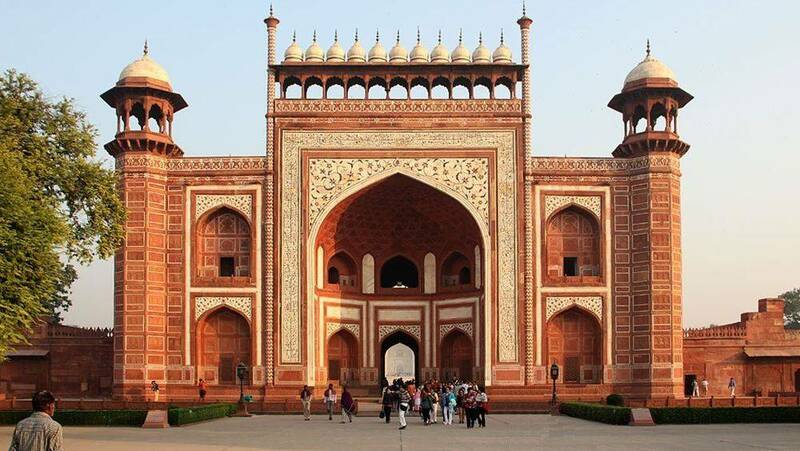 The great gate Darwaza-i rauza is a marvel of Mughal architecture. It separates the inner courtyard and the gardens and is the only real entry into the Taj Mahal site. It is a symbolic transition between the real world, the secular world, and the spiritual world, in which we will find a representation of Paradise (Gardens), as well as a mosque and especially the famous mausoleum. For those who wonder why Paradise is symbolized by a garden, it is enough to put itself in the place of the constructors. In the 17th century in India the country is rather arid, a garden is seen as a pleasure bringing freshness and food source, abundance. It was then a rare benefit that could symbolize Paradise. The door is a rectangle of imposing, very high and very worked. It is above all an iwan (traditional gate halfway between the porch and the niche, which is found in Persian architecture essentially) It is surmounted by 11 domes framed by two masts. The iwan is itself framed by two octagonal towers giving a military aspect to the construction. Between the iwan and the towers there are two pairs of smaller iwans, as well as within the main iwan are two rows of smaller iwans. In the frame of the door the main mausoleum stands out, echoing it. The door is made of bricks covered with red stones and white marble, there is a beautiful work of lapidary marquetry on this building, complemented by excellent bas-reliefs. These decorations have a great symmetry, as much on the central arch as on the decorations annexed or not very visible. Some of these decorations are quotes from the Quran calling the visitor to enter the Paradise Gardens. Learn more about the Great gate. 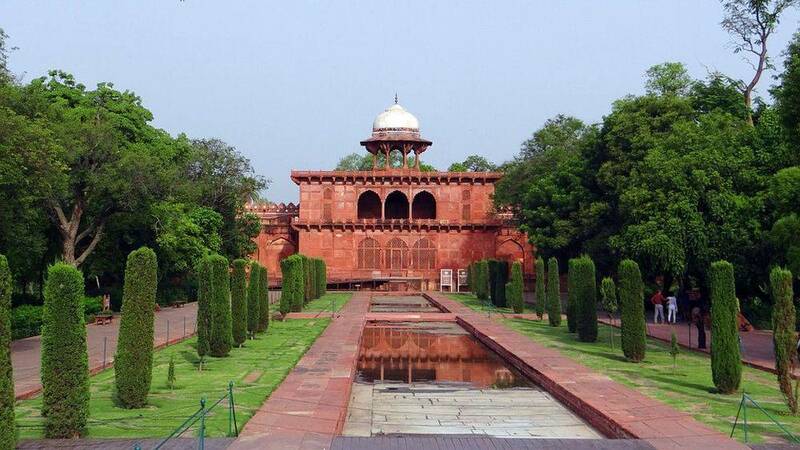 Most Mughal gardens are rectangular with a pavilion or a central tomb. The Taj Mahal garden derogates from this rule by pushing the main mausoleum to an unusual place at the bottom of the garden. (See the various hypotheses that may explain this). This garden is a square of 300m of side divided into 4 pieces by 4 calm water bodies (when the fountains are not in march) in which is reflected the mausoleum. They are oriented towards the 4 cardinal points. The central part is highly symbolic, here it is composed of a terrace and a large marble fountain. Each sector is divided into 4 by perfectly rectilinear secondary roads, delimiting 16 lawns dotted sometimes with flowers, trees, perfectly controlled groves. Nature has no rights to the Taj Mahal, everything is perfectly symmetrical, organized. The style of this garden is Persian with a strong Muslim influence, this style was introduced in India by Bâbur. It should be pointed out, however, that although the rectilinear layout was original, the original garden was much more sported, the English reduced it to large, flawless lawns. One of the 4 bodies of water reflecting the mausoleum. As a symbolic number 4 is found all over the garden. It is a reference to the 4 rivers of Paradise of which the Quran speaks. There are 4 canals here, 4 lawn areas divided into 4 sub-sectors, the mausoleum with 4 minarets , 4 secondary domes and so on. It even seems that the garden contains 400 plants, but that is more difficult to verify. Since the discovery of Mahtab Bagh, also called "Garden of the Moonlight", Archaeological Survey of India has an original interpretation of the Yamunâ River which closes the site to the North, they believe that the river was an integral part of the site and had to be seen as one of the rivers of Paradise. The Mahtab Bagh is the archaeological site on the other side of the river. It perfectly extends the walls of the monument on the other side of the river. This consideration goes once again in the sense that we must consider the gardens of the Taj Mahal as a representation of Paradise. Why would a garden be a Paradise? Because in the seventeenth century in India, the climate was arid and a garden was a bountiful source of freshness, besides a garden is also feeding. For the inhabitants of this time and place, a garden represented a great happiness that could symbolize Paradise. Moreover, the Arab civilization, the provider of Islam, came from a desert region, so water was a symbol of life. This is why there are many fountains or bodies of water on a symbolic place of Islam, see a luxurious place. In the same way, there are sometimes cypress trees in such a garden, the cypress being a symbol of mourning in the Muslim tradition. The 4 bodies of water do not join in the center of the lawns, there is a space through which to pass in the center of which there is a fountain. It is named "Al Hawd al-Kawthar", which literally means "Cistern of Abundance". It is a reserve of marble water, a little elevated, whose purpose is to quench the thirst of those who arrive in Paradise. There are 5 fountains in this water reserve, one at each corner and a 5th at the center. The corner decorations are floral style. The fountain is also equipped with 4 marble banquettes placed face to face, on each side of the fountain. They were added by Lord Curzon in 1907-1908. It is said that the Sultan Parvez has his grave in this garden, in the center of Char Bagh garden, which would mean that it is under the fountain. The existence of the garden was confirmed by Francisco Palsaert, officer of the Indian Company in his book "Remonstrantie". The officer said it was one of the most beautiful gardens along the Yamunâ River. A painting by the famous Mughal painter Manohar shows Sultan Parvez received by Jahângîr in a garden that was later identified as the garden of Parvez, that is at least highly probable. Anyway an 18th-century map shows this garden with the tomb of this prince. The Taj Mahal Museum is known as the "Jal Mahal", on the west side of the complex, at the level of the gardens. This is the "Naubat Khana". Established in 1982, it occupies the entire ground floor of the building which has a floor. It is rectangular in shape, built on a terrace, as is the case with most of the buildings on this site. The museum includes three galleries in addition to the main hall and highlights various exhibits related to the construction of the Taj Mahal (mainly), as well as to the period of its construction. He exhibits 121 very interesting pieces of antiquity, most of the miniatures of Mughal painting, manuscripts, government decrees, calligraphy specimens, utensils of everyday life, plans and drawings of the Taj Mahal, etc. There are also some paintings, marquetry objects, carved marble pillars, etc. The main hall has paintings by Shah Jahan and his favorite wife, Mumtaz Mahal on ivory framed in ornamental wooden frames. There are also replicas of Akbarabad coins, paintings of the famous Shahnama of Persia, an interesting manuscript of Chehlum Majlis dated 1612 and bearing the signature of Shah Jahan under the royal seal (dated 4 February 1628 ) There are also other period documents in the main hall. 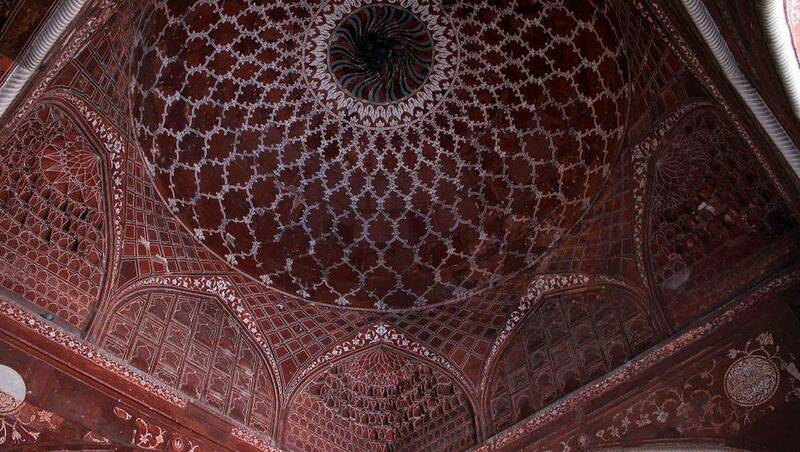 The first gallery contains color drawings and drawings showing the main features of the architecture of Tai Mahal. The most interesting is a site map, with front elevation of the mausoleum and other details that are drawn on this plan. There are also copies of Shah Jahan's letters from August 1632 to Raja Jai ​​iingh and another document dated June 20, 1637 addressed to Raja Jai ​​Singh of Jaipur in which he claims to ensure a regular supply of marble of Makrana necessary for the construction of the imperial building, the Taj Mahal. The second gallery shows some pieces of porcelain and jade like a carved jade Koran, a beautiful vase dug in another piece of jade, a mirror mounted on stone, bowls and Celadon dishes. It is here that one can also see swords, daggers and a map of the world showing the places from which the stones were imported for the work of marquetry of the Taj Mahal, all presented with specimens of these stones semi-precious. Finally the third gallery contains important royal documents written in the period calligraphy, two paintings of Taj Mahal by the British artist Daniel (1795). There is also an interesting order from Perron, a general from the time of Shah Alam II, who orders to record the details of the fruit auction in the garden of the Taj mausoleum. There are also royal decrees of Shah Jahan concerning the registration of a grant of land in various villages and confirming a grant of hereditary land to Shaikh Hatim. In short, there are quite a lot of historical documents, and that's what makes this museum interesting, even if you just fly over them. Learn more about the Museum of the Taj Mahal. The "Chameli Farsh" is the large terrace north of the Taj Mahal complex. It is a terrace filled with river stones and overlooking Yamunâ, the river that passes in Agra and just to the north of the site. This terrace, 7m high with respect to the gardens, supports the mosque, the Jawab and the mausoleum. The northern part, facing the river, is called "Tahkhana". 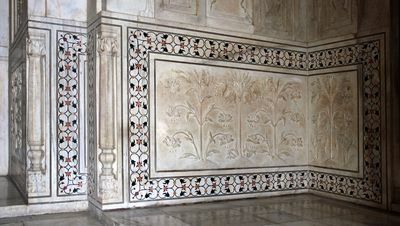 It is a stone wall inlaid with marble and arches. If you go a little closer you see that these arches are connected by a narrow gallery that joins the 4 corner pavilions, which are seen as outer towers. The terrace contains on its right the mosque and on its left the pavilion of the guests (jawab). In the center there is the main mausoleum in white marble. The latter is placed on another marble terrace measuring 93m square, perfectly square. It is in the center of the main terrace. The mausoleum is thus isolated from the rest of the world by two successive terraces, showing the will of the builder to put on a pedestal the tomb of the Shah's wife. The floor is made of a red material of a particular texture. It seems delicate, fragile. In the shade one can have the impression of a fabric of red velvet. The name Taj Mahal means "Crown of all palaces", it comes from Persian, and its beauty makes it one of the most beautiful monuments in the World. It is the symbol of eternal love, having been built solely for the purpose of offering a woman a tomb worthy of her husband's love. The Taj Mahal is the most perfect example of Mughal architecture, halfway between Persian, Islamic and Indian influences. 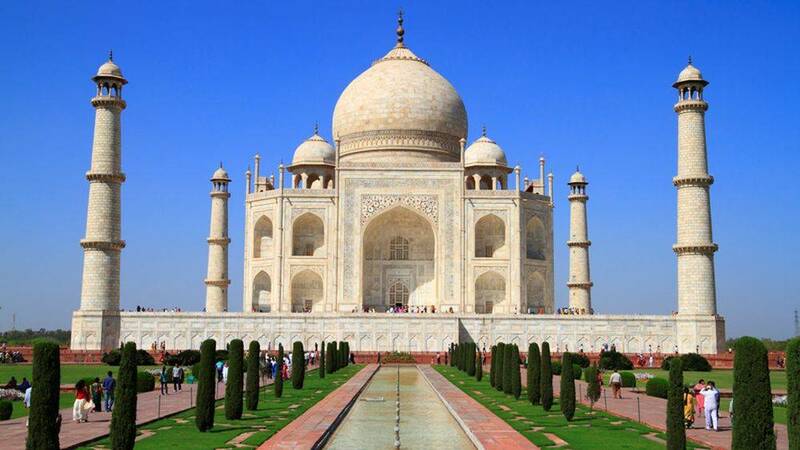 It is an octagonal white marble building with 4 main sides and 4 intermediate sides. The whole is perfectly symmetrical. The main faces all have an iwan, these giant ogive-shaped porches. At the top is an impressive bulb-shaped dome. Despite its impressive proportions it seems to be very light, it is due to both the fineness of the decorations and the good proportion of the iwans who dig the facades in a harmonious whole. This is typically a Persian style, and is found in several buildings in Uzbekistan, for example. The main room is central, it is octagonal too and measures 35m aside. It is covered with an internal dome that goes up to 35m high! 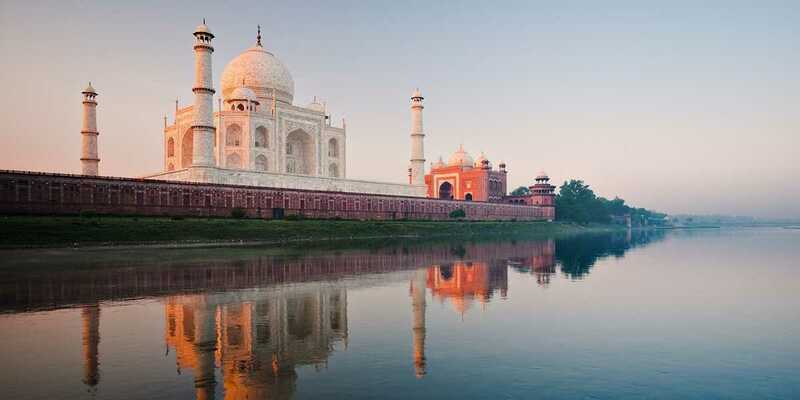 It contains the cenotaphs of Shah Jahan and especially of Mumtaz Mahal. Recall that a cenotaph is a false grave, the monument has all the characteristics of a tomb but does not contain the bodies, which are in the crypt, just above. 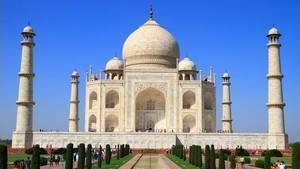 The arrangement of the cenotaphs is also symbolic since that of Mumtaz Mahal is at the center of the room while that of Shah Jahan is at his side, therefore a little shifted towards the West. It is one of the few elements that is not symmetrical here. The cenotaphs are surrounded by a balustrades whose quality of execution is exemplary. Made of marble on the basis of floral motifs it is entirely polished and encrusted with semi-precious stones. The resemblance between this architectural element and nature is close to perfection. There are mainly grapes, various fruits and flowers. The balustrade is octagonal, it too is made of 8 sides. The mausoleum contains a richly decorated cripte, which contains the two tombs. They are slightly elevated, like the cenotaphs. The interior of the mausoleum is divided into five octagonal rooms: the main room is central, it contains the cenotaphs. The four others are at the four corners, they are surmounted by a small dome. The dome of the Taj Mahal is often called the bulb, because of its characteristic shape. It is highlighted by four smaller domes of the same shape. It is possible to access the roof and therefore the 4 annexed domes by a lateral staircase, on the south side. The principal dome is placed on a drum, it is an architectural term which designates a short and wide cylinder arranged between the edifice and the dome. Many of the buildings have a dome, such as St Paul Church in London or the Invalides in Paris. Here the drum is still 7m high. 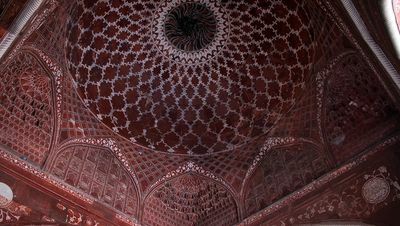 The top of the dome is decorated with a lotus flower that accentuates its size. It means they are identical, just a little bit smaller. The incrustations are mostly black marble, but it can also be jade. The taller inscriptions are significantly wider than those at the bottom to preserve the writing scale. Some of these decorations are not incrustations, sometimes there are bas-reliefs, stucco and, rarely, painting. The 4 minarets are 40m high, they are rather thin and have been designed as genuine mosque minarets, even if they are not intended to be used. Each of them is divided into three equal parts separated by balconies making the tour of the edifice. Their bases are in the marble terrace which supports the mausoleum, at each angle they transform into small octagons. They are very slightly leaning outwards so as to collapse away from the mausoleum, if one day they are brought to be. When visiting the mausoleum only the south door is open, but it has 4 doors, directed towards the 4 cardinal points. 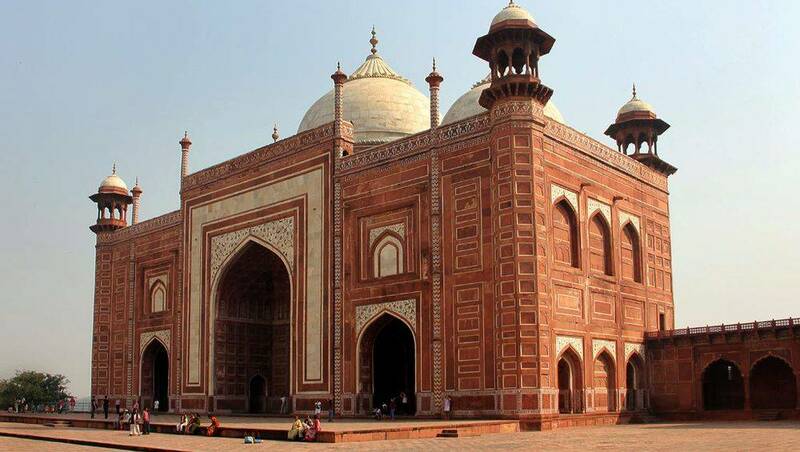 Learn more abut the Mausoleum of the Taj Mahal. The pavilion of the guests is also called a false mosque because it is the counterpart of the mosque which is on the other side of the terrace, towards the East. Facing the opposite of Mecca, Muslims can not use it as a place of prayer. It is also known as "Jawab" or "Response". It is very similar to the mosque, it is made of red stones, but does not contain on its facade of inlays proper to the mosques, like Koranic verses. The patterns are floral, again. They are inlaid in marble in the red stone. It has 3 white domes on the roof, in the same style as those existing elsewhere on the site. The interior is only a large empty nave. Its exact role was not known during its construction, but it was necessary to produce symmetry, counterbalancing the mosque. Perhaps it had a real function, like the reception of the pilgrims, which explains its name of "Pavilion of the guests". It is necessary to note the strange function that it would be for a building placed so close to the sanctuarized mausoleum. Another hypothesis is that it served as a preparation room for funeral ceremonies, much like the sacristies of churches. It could also be a place of refuge for the faithful, before or after the office. The mosque is the counterpart of the guests' pavilion, it is to the west of the terrace, north of the Taj Mahal complex. It is the same building as the Jawab, of the same shape, the same dimension. They both run along the outer walls of the complex. The interior is a large room without separation. The exterior is surmounted by 3 white domes on the flat roof. Only the decorations change since they include essentially the verses of the Koran. This architecture is quite classical in 17th century India. The Shah Jahan has also made other buildings like, for example, the Masjid-i-Jahan Numa in Delhi, which is exactly the same shape, topped by three domes. This is one of the characteristics of Indian mosques. Learn more about the Mosque and the pavilion of guests. The surrounding wall of the Taj Mahal is exactly 1770m, it is relatively high (6 to 8m) is regular. It is made of red stones. Its northern part, facing the river, is very worked, it is encrusted with decorative white marble. In the South the wall is pierced with a door, the door "Sidhi" or "Sirhi Darwaza". It is in the center of the wall to have a good symmetry. 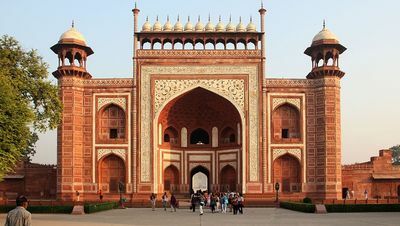 This door is relatively simple, it is dominated by a small rectangular building high and allows to control who enters and who leaves the Taj Mahal. Two other doors are also pierced on the East and West facades, but these are not centered on the wall, they are centered in relation to the width of the inner courtyard, to the south of the complex. They are also guarded by two buildings, a little lower than that of the South Gate. They are called "Fatehpuri Darwaza" for the West Gate and "Fatehabadi Darwaza" for the East. On the east and west flanks the visitor will be able to see two other buildings, a little further north, along the ramparts. The corners between the inner courtyard and the gardens are dominated by these two discreet towers, surmounted by a dome of the same style as the mausoleum. A little further north we fall on the pavilions extending the lakes of the gardens. These are the "Naubat Khana" East and West, pavilions of small sizes surmounted by a dome. They are encrusted in the wall and form false doors through a decorative pattern in the form of a blind arch. Under these false doors pass two acqueducs bringing water from the river Yamunâ, north of the Taj Mahal, to the water level of the gardens. This is how these water bodies are fed. Also on the east and west flanks are two other small buildings, one per corner of the north terrace. Topped by a small dome, they are more decorative than anything else. Between the two, on each side, are the guests' pavilion and the mosque. The north wall wall is magnificent. 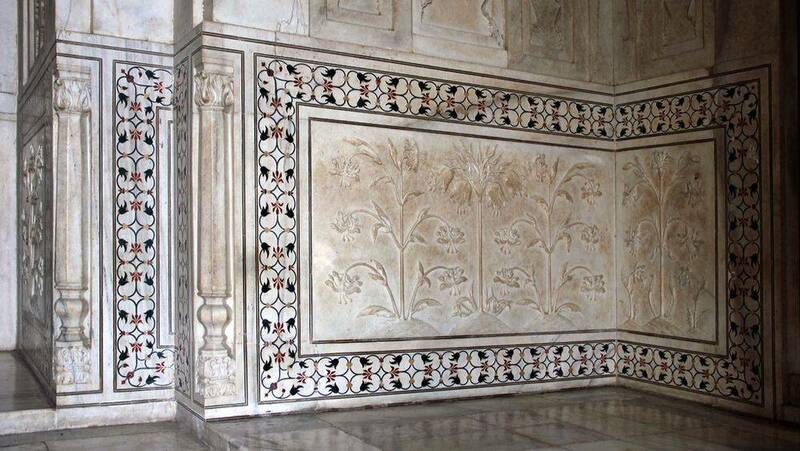 Made of red stones, like all the enclosure, it is inlaid with decorations in white marble of great finesse. 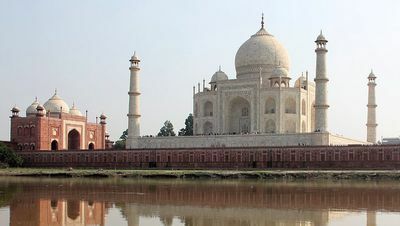 The north face of the Taj Mahal is in contact with the Yamunâ, the river that passes in Agra, so the wall is the strike. On the other side of the Yamuna, on the northern shore, is a garden and the remains of a building similar in style to that of the Taj Mahal. What is truly astonishing is the delimitation of the terrain, whose perimeter wall is perfectly aligned with those of the Taj Mahal, much as if it were only a single site separated by the river. We even imagine a 300m wide bridge connecting the two banks, but it never existed. 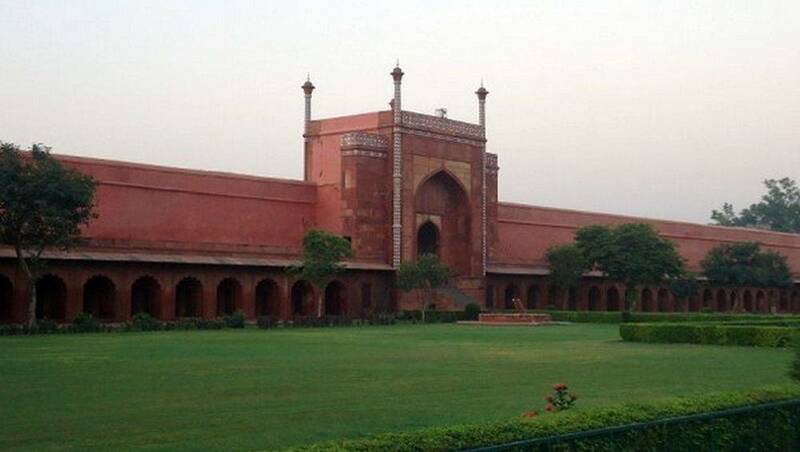 This site was created by Bâbur, the great-great-grandfather of Shah Jahan, it was a Mughal-style garden since Bâbur was the first Mughal emperor of the dynasty. 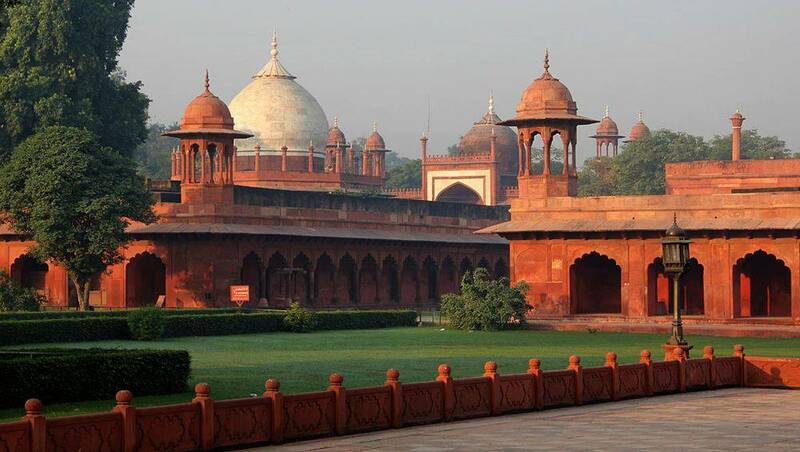 Mehtab Bagh, as it is called, is considered the first Mughal style garden in the World. Mehtab Bagh means "Garden of the Moon". Recent excavations have revealed the presence of a large octagonal basin fed by 25 fountains, another central basin and a "baradari" in the east. This garden was flooded in 1652, but this event was the trigger for the writing of a letter from Aurangzeb to Emperor Shah Jahan, a letter in which the presence of this garden is recorded, which has later confirmed by recent excavations. 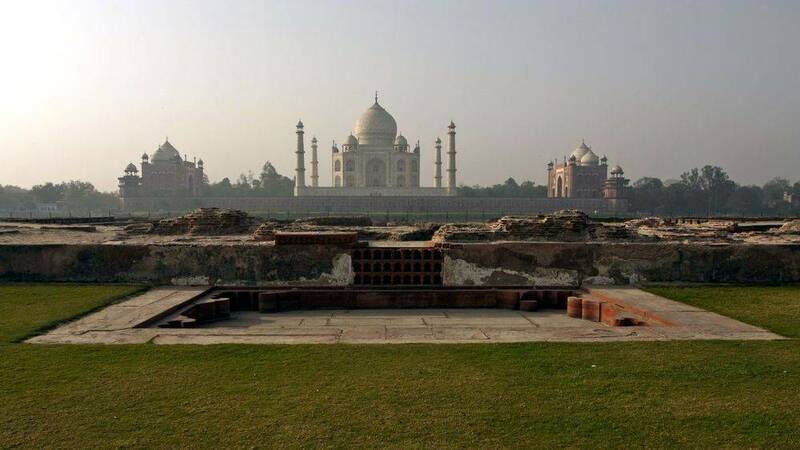 To verify the presence of this garden is important to be able to refute the myth of the Taj Mahal black, explained below. This site is nowadays a very pleasant garden, heavily raised, which delivers a superb view on the Taj Mahal. Recall that it is as beautiful seen from the North as from the South since it is perfectly symmetrical. Only the light of the Sun can make the difference. The Taj Ganji is the only architectural element of the Taj Mahal that no longer exists today. It was a large square situated to the south of the inner courtyard on which was the arrival of the caravanserais and the market. It was therefore a place for the exchange of goods, services, a place of departure and arrival, a meeting place, and so on. As a market place, the people of Agra met on the spot to recover what they needed to live. Alas, this part of the Taj Mahal did not survive the urbanization of the city and it is an element that has disappeared. It must also be said that it was the closest to the daily life of the inhabitants, so it is not abnormal that he went to other places when the need arose. It should also be noted that this intense place of life, anchored in the daily life of the inhabitants, was in contact with the inner courtyard of the Taj Mahal which is, let us recall, a place of passage between the temporal and spiritual world symbolized by the gardens. The origin of the myth of the Black Taj Mahal is lost in the darkness of time, but is highlighted by the presence of the Mehtab Bagh, perfectly symmetrical to the monument on the other side of the river. The idea is that Shah Jahan had from the beginning had the will to build a perfectly identical replica of the Taj Mahal on the north shore, but in black. It would have been possible because the Mughals knew the existence of black marble and used it regularly, for example in the decorations of white marble. If this idea is very original, it never really existed, and the site never thought with a black pendant on the north shore. A rapid study by the Indian authorities has shown that the Moghul treasury coffers in the middle of the sixteenth century would not have borne the cost of a second construction, and as on the northern shore there was already a garden, it is impossible that the black Taj Mahal could have existed. 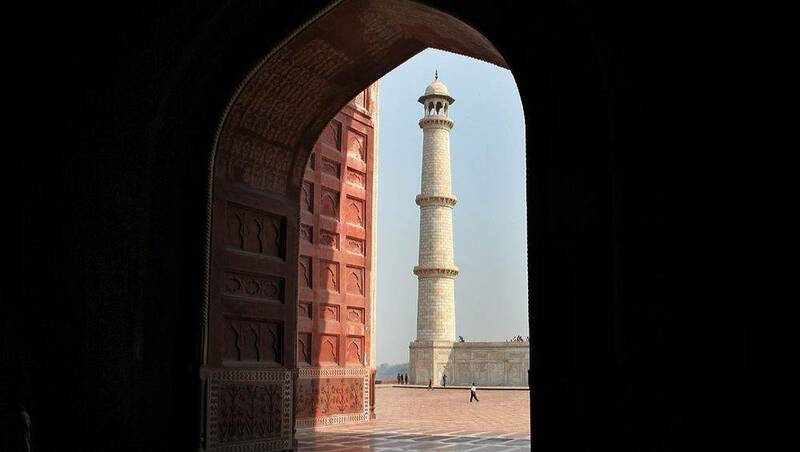 Learn more about the legend of the black Taj Mahal. 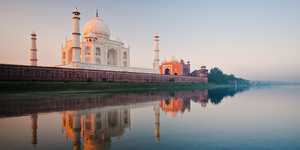 Learn more about the legends of the Taj Mahal.